Forum Index > Off-topic Talk > Where did the knights put their helms? Posted: Fri 15 Feb, 2008 4:55 pm Post subject: Where did the knights put their helms? When conditions called for wearing an armor, the knights who had helms with visors probably would not want to ride with their visor down for any significant time period. the visor is bound to frequently close from the riding movement. Did they have a hook on the saddle or anything like that to keep the helmet off and yet have it within the arms reach? They could probably entrust it to the squire, but not every knight had a squire..
Well, many great helms of the 13th and early 14th centuries had small cutouts near the lower edge, through which a toggle was threaded on a long chain attached to the belt or cuirass. This allowed the helm to be slung over the shoulder when not in use. See this monument of Colaccio Beccadelli (1341) for instance. You could also hold it in front of you on the saddle, between you and the horse neck. Read somewhere that the monument was repaired or restored at some time and the helm put into that position ? This could be wrong as I can't remember the source. On the other hand lets assume that one would hang the helm over the shoulder using a chain: Would this be for a short rest and to get some cool air in battle ? Or the chain just to not lose the helm should it be knocked off one's head in the same way that there was a fashion to have sword and dagger also secured to the breast plate by a chain that lasted a while and seemed popular with German Knights ? But would one want or be able to ride for any extended time with a heavy 5 to 8 pound held bouncing around over one's shoulder ? I tend to be sceptical about this being practical. I think you're thinking of a different monument, perhaps the statue of Can Grande della Scala. Since the Beccadelli monument is a grave slab, it would be nearly impossible to move the helm somewhere it wasn't. Definitely a statue: Not sure which one ? The helm if I remember correctly looks like it's stuck at the top of the back at an angle. EDITED: Just Googled " Can Grande della Scala statue " and it's the one I was thinking about. Looking at the Beccadelli slab it does really look like the great helm is slung over the shoulder but I still wonder/curious how stable and comfortable this form of carry would be. I assume that if it was common practice it was also not a serious hindrance. Well, the helms would probably not have been slung like that during heavy riding. As you say, that would probably become most uncomfortable, if not dangerous. I certainly wouldn't want to receive a bouncing helm to the back of my skull. The great helms, being both heavy and impairing vision to an extent, would probably be best suited to use during cavalry charges. This would probably be the only time one would be galloping on a horse no? At any other time you would be going much slower, and would not be in any immediate danger. Thus the helm could be safely slung over the shoulder to allow the knight greater comfort. I believe that that helm was also discarded by some knights during melee combat, because of it's (relatively) unwieldy nature. The sling it over your shoulder with a chain solution was only used for a short period of time - mid 14th century - in a limited area - Germany. The most common answer must be something else then. Such as putting on the pommel of the horse, giving it to your esquire to put with the baggage while you wore a lighter helm, removing the visor (such as on bascinets) etc. There are quite a few instances in literature of the period when it mentions men lifting their visors in melee so it can be assumed that at least at some points they'd leave them down as well as at times flip them up. Usually these stories have a moral lesson to keep your visor down as once the knight lifts it an arrow, poleaxe, lance, sword etc. speeds in and ends them. Many helmets visors will once flipped up rest there on there own. Helmets in the 16th and 17th do have arms, locks, pins and other devises to lock them up or down. Great helms are interesting. There is a great deal of artwork woth men fighting on foot with great helms on. There are also instances where in effigies men are show without great helm on but another smaller on with the great helmet beside them. I do not know if that means that one was specifically intended for the joust or mounted combat the other for melee or if in melee some knights discarded their great helms for better visibility or breathing. I think most of these are assumptions. All I do know is that after a while of fighting in my great helm removing it is nice to breath but I can go for some time with it on so I guess it would depend on said knight and the situation. The Black Prince's great helm survives with a length of chain and other English helms of the period show the piercings where a chain would go through, as do helms from Switzerland and other places. So, again, we're looking at more than just Germany where chains were in use. The main purpose of the chain, as far as I know though, was to keep the helm from getting lost if knocked off in combat. Being able to sling it over your shoulder was a side effect of having the chain. I wasn't aware of any non-German examples. Thanks for providing more examples. I still get the impression that it was not at all the norm in any time or place (though now I'm less sure). 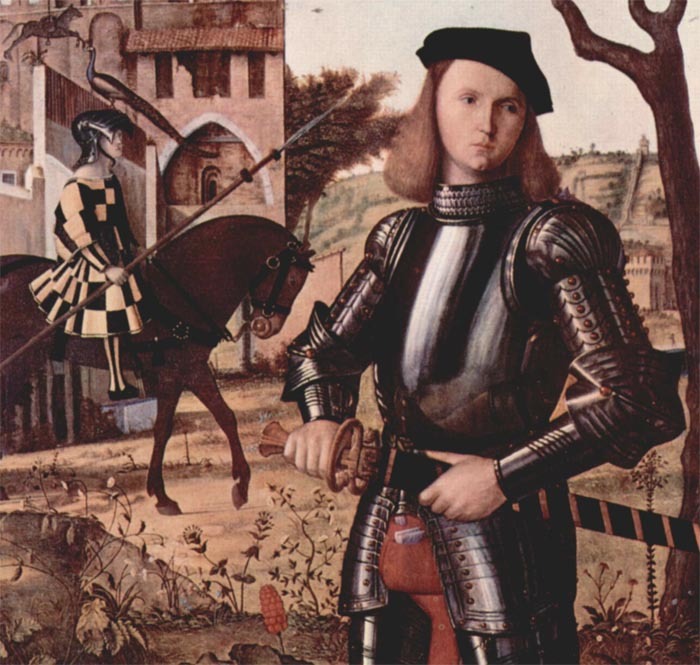 FWIW--This painting by Carpaccio (severly cropped here) depicts an Italian knight, on foot, in full plate but without helmet. His servant is mounted in the background, holding the knight's lance and wearing his helmet. So, there's one way to solve this problem. Any knight would have such retainers on hand to care for his arms and armour in the field, right? His sword looks like katzbalger. Odd for an Italian knight. Very much my point earlier that having the armour near by and wearing all of it is a question of immediate tactical need and a Knight travelling completely alone would not be very likely under any normal circumstances: Even a very poor Knight could probably afford at least one retainer, a warhorse, a riding horse for himself and some sort of nag for his only servant and his armour and extra arms: If not, it hard to call him a Knight or at least a functioning one ! One could add the armed soldier/mercenary with partial armour who might have to wear a great deal of his armour just as a convenient way to carry it around ? I would guess that common soldiers might have some form of common carriage of their equipment in the form of baggage horsecarts to carry the equipment of a bunch of them. This equipment might represent a great deal of his net worth and be indispensable tools of his trade, and so would be very careful to keep it close and not have it stolen ! If thievery among or between soldiers of equipment was a big problem or if it was very strictly frowned upon and punished might influence the wearing of the armour as much as any other factor ?. I wonder if this is just a modern idea that an Italian Knight would use only Italian armour or arms ? Same thing for any other part of Europe were a German Knight might use Italian made armour in Italian styles or Italian made armour in an " export " style that might copy somewhat the German styles but still be recognizable as Italian made. ( Why would an export armour industry even exist if there wasn't a market for it in other countries ). A Knight of any location might take a fancy to some weapon or armour style typical of another area ? Anyway, just the possibility that " real life " is never as simple as it would seem: So would a future historian say that only a German would drive a German car or Japanese cars were only used by Japanese ? Even today armies/soldiers will use the equipment of other countries: AK 47 by U.S. special forces ? Other examples: In WWII German MP40 and Mg42 were used by allied troops and Russian submachine guns were popular with German troops due to their high capacity and fast firing rates as well as very high reliability ( no jamming ). In some cases even enemy tanks were put to use after being repainted if they were repairable by all sides. ( care would have to be taken to not be shot at by one's own side though. As Jean suggests, this sword form was common in Italy as well, in the same way that Italian armour was common in Germany and throughout Europe. Lots of diffusion, so it can be tricky to identify nationality based only on arms and armour. The attribution to Carpaccio and the identification of the subject of the painting as Francesco Maria I della Rovere, the Duke of Urbino and nephew of Pope Julius II, seal the Italian identification. I neglected to mention earlier that the painting appears to be packed with symbols of uncertain meaning. One theory is that the figure in the background represents the knight at an earlier age, but that doesn't make much sense to those of us who study arms and armour. Why would anyone wear a visored helmet without any other armour? It also doesn't make sense that the figure would be meant to represent the younger self in some kind of supporting role for an older knight--brother, uncle, father, etc. The helmet is contemporary to the harness worn by the main figure and bears the same finish Logically, it is the helmet for that harness. Maybe the figure in the background is meant to suggest that the duke is off to war. Lots of diffusion, so it can be tricky to identify nationality based only on arms and armour. Maybe the figure in the background is meant to suggest that the duke is off to war. Maybe it is just a pretty artistic composition. Logic dictates that there should also be a guy holding the warhorse of the knight somewhere.